Situated at Junction 24 of the M1, Hilton East Midlands Airport is only 2 miles away from the Nottingham East Midlands Airport and well positioned for the main cities of the Midlands. All rooms have en-suite bathroom, tea and coffee tray, air conditioning, TV with games and satellite channels, direct dial telephone, iron & board, trouser press, radio alarm and hair dryer. Parking is in hotel car park, with entrance and exit barriers and rotating CCTV. Parking is at owners risk. Transfers are by courtesy bus which is available on request. From the airport you will need to call the hotel. The Pavilion Restaurant offers a Table d'hote menu of international cuisine (closed for lunch on Saturday's), and the Piano Bar where light meals are available, with its speciality drinks menu. 07:30, Full English buffet £15.95. Continental Breakfast available 24 hours - costs vary. LivingWell Health Club with a 16 metre heated swimming pool, sauna, steam room and whirl pool spa, fully equipped gym, a beauty salon and fast tanning sunbeds. 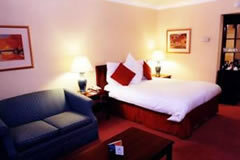 Excellent spacious room with a comfortable bed and great shower. First class shuttle service could not have been better. Also felt my car was securely parked. Always book this hotel with FHR when flying from East Midlands, as very helpful staff at a comfortable accommodating hotel, with good transfer to and from airport. The airport parking wasn't very clear and when we found it we had to park in an uneven field. When we picked the car up we had to remove parking cones to get out. The hotel charged Â£5 to get room service delivered on top of the actual cost which isn't good. I won't stay there again. Lovely hotel, staff friendly, curtious. very officiant service to transport to airport & can highly recommend the pizza. A very professional hotel/transfer operation. The hotel minibus to the airport was very good, the return minibus driver took us to our parked car to avoid any walking with the cases. I would recommend this airport hotel with parking for all early morning flights for those travellers who are over 1.5 hours driving time from the airport. Excellent one night stay at The Hilton with 8 days parking on site. Excellent transport to and from the Airport from the Hotel and the driver was even waiting at the airport for our arrival back from holiday. No fuss and no problems and I would recommend this system to anyone. We did the same thing last year at the Hilton at Manchester Airport and the service was also top class. Thank you FHR. Excelllent. 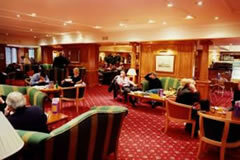 Everything just as it should be, the Hilton East Midlands wsas an excellent choice and very well organised. Excellent transfer service to airport. Very obliging driver. 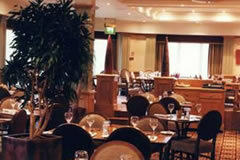 The hotel is located at Junction 24 of the M1.